The average cost of assisted living in Los Lunas is $2,200 per month. This is lower than the national median of $3,346. To help you with your search, browse the 9 reviews below for assisted living facilities in Los Lunas. On average, consumers rate assisted living in Los Lunas 4.6 out of 5 stars. Caring.com has helped thousands of families find high-quality senior care. To speak with one of our Family Advisors about assisted living options and costs in Los Lunas, call (855) 863-8283. Los Lunas, New Mexico, is a charming village located about 30 minutes south of Albuquerque. This small town was initially established as a farming community due to its proximity to the Rio Grande, and that character is still apparent today due to the many small farms scattered throughout it. About 14.4 percent of the more than 15,000 people who live here are 65 or older, and there are three assisted living facilities to serve those who need assistance with activities of daily living. Like all New Mexico assisted living facilities, these communities are licensed and regulated by the New Mexico Department of Health. Los Lunas is an excellent choice for seniors who want to enjoy mild weather while still experiencing four distinct seasons. Summers tend to be hot, with average highs in the low or mid-90s, while winter daytime temperatures are often in the 50s. Due to the arid climate, temperatures can drop significantly overnight. Living in Los Lunas is generally more affordable than both state and U.S. averages. Groceries and healthcare are particularly affordable, although utilities and transportation costs are slightly higher than average. Public transportation is somewhat limited in Los Lunas, but seniors have several options. The Rail Runner train stops in Los Lunas on a route that includes Belen, Albuquerque and Santa Fe, and shuttle service is available to and from the station. Other transportation options are available to qualifying seniors through the village's Transportation Department. Los Lunas has a fairly high crime rate. On a scale of one to 100 with one being the safest, the violent crime rate is 45.8 compared to the U.S. average of 31.1. The property crime rate is also high, with Los Lunas scoring 50.7, while the national average is only 38.1. However, Los Lunas crime rates are lower than state averages. Los Lunas has an array of community resources for seniors, including the Los Lunas Senior Center, Meadow Lake Senior Center and the Fred Luna Multi-Generational Center, which provide daily low-cost lunches along with transportation services, classes and social activities. Los Lunas has few facilities from which to choose in the event of a medical emergency or illness, with the nearest major hospital located in Albuquerque. Assisted Living costs in Los Lunas start around $2,200 per month on average, while the nationwide average cost of assisted living is $4,000 per month, according to the latest figures from Genworth’s Cost of Care Survey. It’s important to note that assisted living rates in Los Lunas and the surrounding suburbs can vary widely based on factors such as location, the level of care needed, apartment size and the types of amenities offered at each community. Most financial assistance given to senior New Mexicans is through Centennial Care, the state's Medicaid program. Other financial assistance for qualifying seniors may be available through the state's Non-Metro Area Agency on Aging. 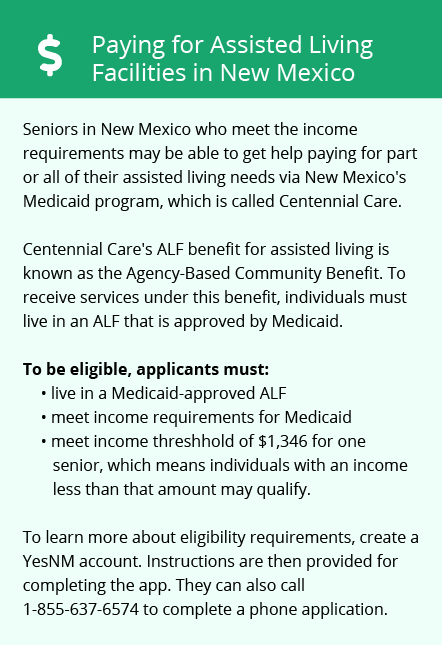 Learn more about these programs, plus who’s eligible, on our Assisted Living in New Mexico page. For more information about different ways to finance assisted living, visit our Assisted Living in New Mexico page. Los Lunas and the surrounding area are home to numerous government agencies and non-profit organizations offering help for seniors searching for or currently residing in an assisted living community. These organizations can also provide assistance in a number of other eldercare services such as geriatric care management, elder law advice, estate planning, finding home care and health and wellness programs. To see a list of free assisted living resources in Los Lunas, please visit our Assisted Living in New Mexico page. Los Lunas-area assisted living communities must adhere to the comprehensive set of state laws and regulations that all assisted living communities in New Mexico are required to follow. Visit our Assisted Living in New Mexico page for more information about these laws.